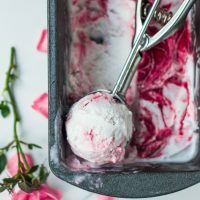 Since Valentines day is a time for roses, I had to share one of my favourite ice cream recipes from my book: Rose Raspberry Ripple. 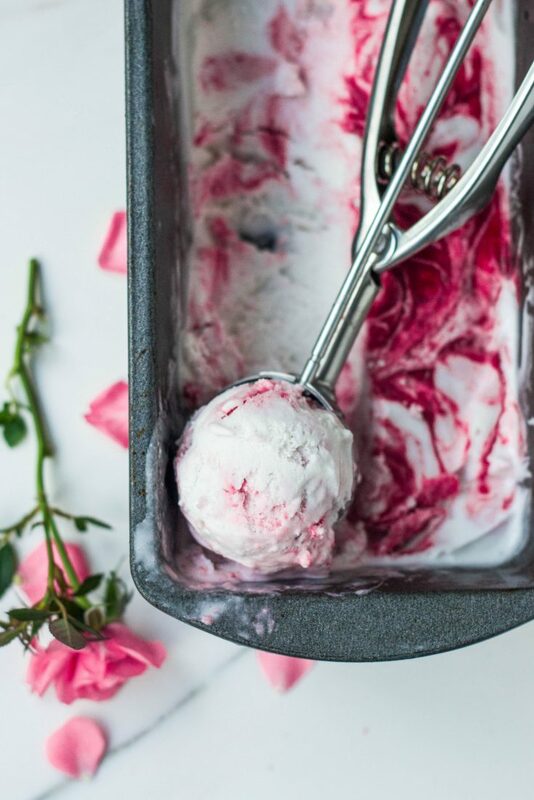 Just one teaspoon of rosewater transforms an ordinary raspberry ripple flavour into a floral delight. So so delicious and the ripple effect is a thing of beauty! optional 1 tbsp alcohol, such as vodka, gin, rum etc. Mix the rosewater, raspberries, lemon and maple syrup together in a blender or food processor until you have a smooth puree. Pour the mixture into a small saucepan and simmer for about 5 minutes until thickened and reduced. Refrigerate until needed for the ice cream. Mix 60ml / 1/4 cup coconut milk with the arrowroot powder in a small bowl and set aside to thicken. Pour the rest of the milk into a saucepan with the maple syrup and bring to a boil, immediately stir in the arrowroot mixture to thicken the liquid. Remove from the heat and stir in the vanilla and alcohol. Chill in the fridge until cold, then churn. Transfer the mixture to a freezer-safe container. Pour the coulis over the ice cream and use a skewer to swirl it through. Previous Post: « JING Organic Teas Review & Giveaway! This really is the prettiest! Me too. I'm all about the swirls!